Four geoscience faculty members from University of Arizona have been elected Fellows of the American Geophysical Union. George E. Gehrels, Jonathan T. Overpeck, Jay Quade, and Peter A. Troch, will all be inducted at the AGU Fall Meeting in December in San Francisco. Election as a Union Fellow is "a tribute to those AGU members who have made exceptional contributions to Earth and space sciences as valued by their peers and vetted by section and focus group committees. This honor is bestowed on only 0.1% of the membership in any given year." The Arizona [Tucson] Daily Star ran a page-2 story on the passing of Bill Dickinson last week, calling him "a leader in the plate tectonics revolution that re-formed our view of how geological forces transform Earth..."
The article noted that Bill received Stanford University's School of Earth, Energy, & Environmental Sciences awarded their inaugural Distinguished Alumni Award last month. Brian Romans posted a number of short videos on YouTube, of informal interviews with Bill. One is embedded below. Permitting delays have reduced the economic value of the proposed Rosemont copper mine by $3 billion according to a new study commissioned by the National Mining Association. NMA commissioned the study "Permitting, Economic Value and Mining in the United States", "to demonstrate the economic impact of mining project permitting delays in the United States." The study researched "selected mining projects at various stages of operations and permitting, in a number of states, to assess the delays that are associated with mine permitting." planned start date of 2010. Over this period, the value of the project has fallen from $18 billion to $15 billion despite much higher copper prices." Unexpected delays in the permitting process alone reduce a typical mining project’s value by more than one-third. The higher costs and increased risk that often arise from a prolonged permitting process can cut the expected value of a mine in half before production even begins. The combined impact of unexpected, and open-ended, delays and higher costs and risks can lead to mining projects becoming financially unviable. The study found that permitting in the US takes 7-10 years compared to 2-3 years in Canada and Australia, countries with comparable environmental requirements. I spoke with Katie Sweeney, General Counsel for NMA on our video magazine "Arizona Mining Review' and she said the solution is not to weaken environmental regulations but to require permitting agencies to coordinate their reviews and abide by deadlines. There is also federal legislation being proposed to require agencies to complete their reviews within specific time-frames, comparable to those in other developed countries with stringent environmental standards. 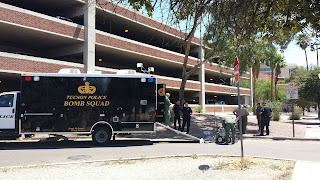 A bomb threat to the Attorney General's office prompted evacuation this morning just after 10 am, of the State Office Complex in Tucson where AZGS is housed. Police just gave us clearance to return to our offices after 3 and a half hours. 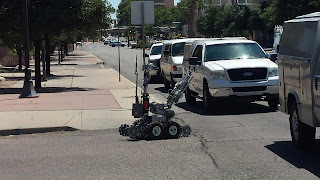 They brought in bomb-sniffing dogs and a robot from the Tucson Police Bomb Squad [ right, robot rolling off the ramp. bottom, robot on its way to investigate backpack. Trucks in the street carried the canine units]. News reports say similar threats were called into the Attorney General's offices in Phoenix and Prescott. The Tucson office was the last to be cleared because of a suspicious backpack found outside our building entrance that was situated such that if it was a bomb, would have been aimed at people leaving the main entrance. 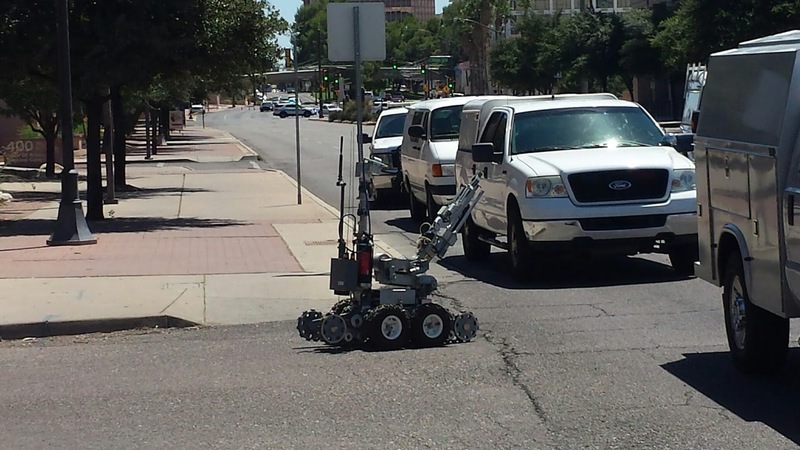 The robot unit was sent in to investigate along with officers in body armor and blast gear. From conversations with officers on the street, nothing was found., and we were allowed to return about 1:30 pm. For most employees, our vehicles were in the parking garage and not accessible. After about 2 hours they brought in city buses so state employees could get in out of the heat which has been just under 100F. A lot of folks headed to nearby stores and restaurants for an early lunch and cooler air. 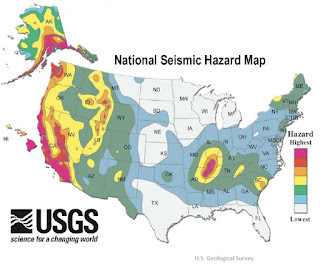 How would Arizona handle a major earthquake in California? 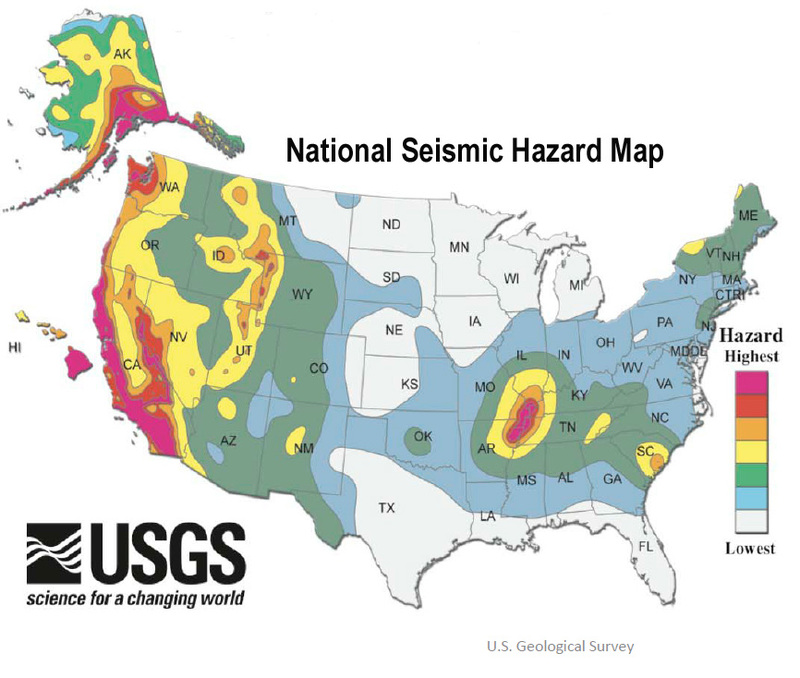 We recently got an inquiry referencing a blog post I did some time back about whether Californians might stream into Arizona looking for shelter and assistance if a major earthquake strikes that area. 1. The SERRP is an all-hazards plan. It contains 15 Emergency Support Functions, and Logistical Support and Specific Incident Annexes. 2. Arizona is a member of the Emergency Management Assistance Compact, an agreement of mutual aide and support amongst the States. 3. State agencies have specific rules, laws, and authorities that may allow them to engage immediately in their subject matter area in support of other states' requests. In this case, a state agency may ask for coordination support from the State Emergency Operations Center to supplement their response work, whether in-state or at the request of another state. 4. FEMA Region IX has constructed a Concept of Operations Document with Arizona to allow for immediate synchronization of efforts in a catastrophic situation affecting Arizona and/or other states in Region IX's area. These elements allow for rapid support in the initial response, short-term and long-term recovery. The recent I-10 bridge failure in California demonstrated #2 and #3 above, as ADOT and CALTRANS worked to coordinate traffic control, information flow to the public, and situation reports regarding safety of the rest of the road infrastructure along I-10. Hats off to ADOT for keeping the Arizona State EOC fully informed of their support to CALTRANS, including the use of WEBEOC to inform all concerned in a real-time basis. This background supports the answer to Evacuation of California as a result of a catastrophic earthquake. Arizona would support California's request for evacuation support and reception. It would be upon California to define and determine (and inform) Arizona how it would map and time the evacuation. Both Arizona and California's transportation and emergency management agencies would be closely involved in developing this timeline and the support needed. This timeline would be incident specific, and could change on the fly. It is important to note that California has not engaged with Arizona, to my knowledge, in the past regarding evacuation planning as a result of a catastrophic earthquake. We would welcome the opportunity. As a final note, cursory research of after action reports and available academic research indicated to our office that residents in California affected by earthquakes in the last thirty years were unwilling to evacuate. Instead, they chose to camp in available spaces (parks, shelters, etc.) nearby to wait to go back in and rebuild/repair. Mariano shared that ADEM would like to work with California to develop a Concept of Operations document to better coordinate and cooperate in the event of a big quake. Vanterra Energy which owns oil and gas leases in the area may have "farmed out" their acreage to another company that would earn an interest in the acreage by funding seismic and drilling a well to 12,000 ft.
Forest Gate Energy announced today a partnership with Vanterra Energy and plans to drill a deep exploratory oil well in the Sacramento Valley of Arizona, southwest of Kingman. The press release said, "Forest Gate and Vanterra are planning to drill an 11,000 foot well targeting the Navajo sands at 6000 feet, the Mississippian carbonates at 9,160 feet, and the Devonian carbonates at 10,160 feet.. A drill site has been selected using the results of a seismic program acquired by Phillips Petroleum in 1981 and subsequently licensed to Vanterra." Forest Gate said they have run geochemical and geophysical surveys over the prospect. They compared the target as similar to the Grant Canyon oil field in Nevada [above, generalized geology of oil fields in Railroad Valley, NV, based on work done by Don French], which occurs in a block of Paleozoic sediments, down-dropped along a basin-bounding fault and perpendicular block faults. A seismic exploration company is carrying out a geophysical exploration program in Golden Valley in Mohave County to assess the potential for oil and gas deposits. The company's 'thumper' trucks [right, credit Nodal Seismic] send vibrations into the ground which bounce off different geologic units and are recorded at the surface by seismic sensors. The seismic signals provide a map of the shape and nature of rocks in the subsurface. According to news reports, California based Nodal Seismic is collecting the seismic data for what I interpreted to be a 'spec' survey. In other words they would not be "shooting" the seismic data (a historical term when dynamite was used to send the signals into the ground) for an oil company client but would collect it in order to sell it to petroleum companies to generate interest in the oil and gas potential of the area. Update 7-24-15, 8am: Since I wrote this, I understand Vanterra Energy may have an agreement with another company that would earn an interest in their leased acreage by funding the seismic acquisition and drilling of an exploratory well. An article in the Kingman Daily Miner quoted residents as worrying about the impact of hydraulic fracturing or 'fracking' on their groundwater. First, this is only a geophysical exploration program. No one has proposed drilling any wells. And even if wells were drilled, hydraulic fracturing is a technique that is used in only certain geologic environments. We have not seen anything to suggest that geology in Golden Valley would be suitable for fracking. The Arizona Oil & Gas Conservation Commission permits and regulates all oil and gas drilling and would specifically have to approve any hydraulic fracturing operations. So, don't panic. There are a lot of 'ifs' before any of this would lead to drilling or development. There have been over 1,100 wells drilled for oil and gas in Arizona and only a handful ever produced and they are on the Navajo Reservation just on the border with Utah. We just learned from his family that William "Bill" Dickinson, Professor Emeritus in the Dept. of Geosciences at the University of Arizona, died in his sleep early yesterday morning while doing field work in Tonga. His bio on Wikipedia notes that Bill was a member of the U.S. National Academy of Sciences. Prior joining the University of Arizona, Bill was a professor at Stanford University. He joined the UA faculty in 1979. Dickinson is renowned for his work in plate tectonics, sedimentary geology and Pacific Oceana geology and is considered one of the foremost experts on the geology of the Colorado Plateau. Dickinson is one of the founders of the Gazzi-Dickinson Method and its primary application, QFL diagrams and their use in sandstone provenance. Dickinson's research includes studying the potsherds (historic or prehistoric fragments of pottery) of Pacific Oceana. Over the years, he has visited hundreds of Pacific Islands collecting and dating sherds. The area has become world famous in the past 20 years, attracting large numbers of foreign visitors on top of the growing popularity of the site among US hikers. The changes suggested by BLM will transition all permitting in the area to an online system, including swapping a next-day walk-in lottery system for a 48-hour online one. Half of the 20 daily permits issued for Coyote Buttes South and North, where The Wave is located, are currently issued in the next-day lottery, which can attract more than 100 people per day... That same portion, 10 per day, will move to the 48-hour lottery, allowing people to better plan ahead for their trip. The BLM’s draft plan also will raise fees, including an increase from $5 to $10 per person per night for overnight camping in Paria Canyon and an increase of the permit fee for Coyote Buttes North and South from $7 and $5 per person per day, respectively, to $12 per person per day. A $6 service fee would be charged by the online system for each permit issued. The St. George [Utah] Spectrum says the public is invited to provide feedback on the permit process and proposed fee increases, both of which are addressed in the Paria Canyon-Canyon Buttes Special Management Area Draft Business Plan, by August 17. We're back in Tucson and connected to the rest of the world online after a brief sojourn to the family cabin in northwest Wyoming. My first time off in 14 months came after completing major deliverables for our two biggest funded projects due at the end of June. The drive took us along the section of US89A rebuilt and recently reopened after a massive landslide took out a section of the road and rerouted traffic in and out of Page. ADOT engineered a huge buttress downslope to stabilize the megaslide area (right). My blogging is way down the past year and more due to the press of so many projects but I have a good sized stack of items to write about. Copper has fallen 19 cents at the start of the past week, and was down 30 cents the past month. The close on Wednesday was $2.42/lb after briefly touching $2.40. The price rallied back to $2.54 by week's end. 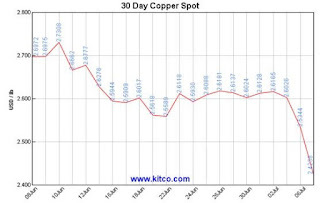 Phoenix-based Freeport McMoRan Copper & Gold, the world's largest publicly traded copper producer saw their stock plummeted to $16.03 intraday.on Wednesday. 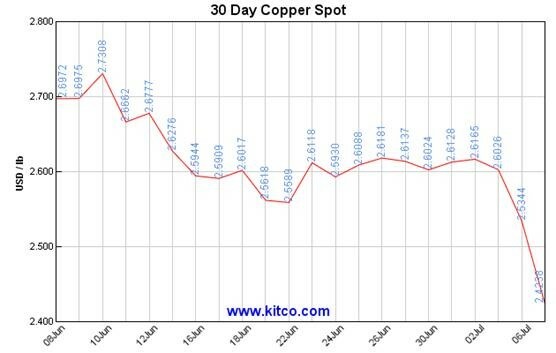 The price drop is not restricted to copper but is affecting all metals. 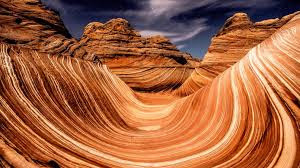 Arizona produces about two-thirds of the copper used in the US, so the price has a big impact on jobs and the economy.